BACKGROUND AND PURPOSE: Oxygen-ozone therapy is a minimally invasive treatment for lumbar disk herniation that exploits the biochemical properties of a gas mixture of oxygen and ozone. We assessed the therapeutic outcome of oxygen-ozone therapy and compared the outcome of administering medical ozone alone with the outcome of medical ozone followed by injection of a corticosteroid and an anesthetic at the same session. METHODS: Six hundred patients were treated with a single session of oxygen-ozone therapy. 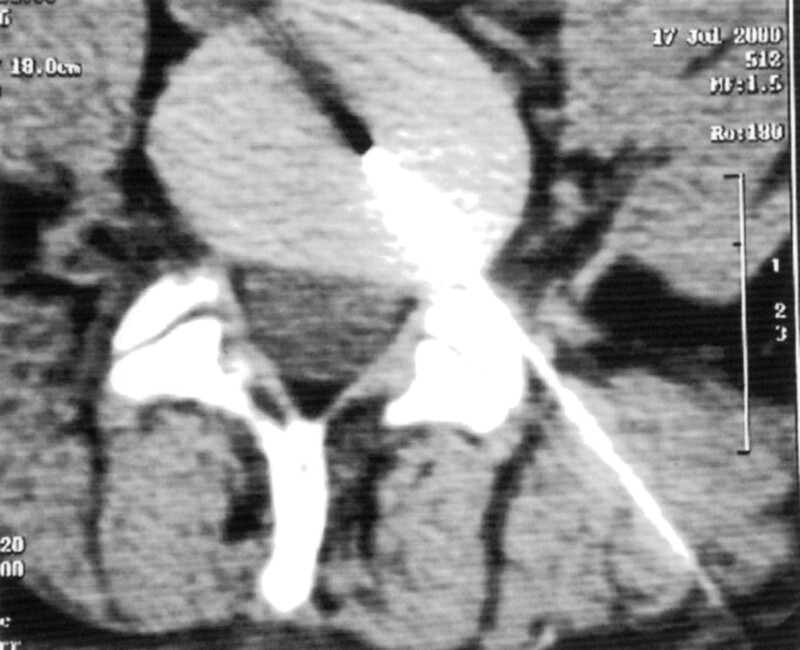 All presented with clinical signs of lumbar disk nerve root compression, with CT and/or MR evidence of contained disk herniation. Three hundred patients (group A) received an intradiscal (4 mL) and periganglionic (8 mL) injection of an oxygen-ozone mixture at an ozone concentration of 27 μg/mL. The other 300 patients (group B) received, in addition, a periganglionic injection of corticosteroid and anesthetic. Therapeutic outcome was assessed 6 months after treatment by using a modified MacNab method. Results were evaluated by two observers blinded to patient distribution within the two groups. RESULTS: A satisfactory therapeutic outcome was obtained in both groups. In group A, treatment was a success (excellent or good outcome) in 70.3% and deemed a failure (poor outcome or recourse to surgery) in the remaining 29.7%. In group B, treatment was a success in 78.3% and deemed a failure in the remaining 21.7%. The difference in outcome between the two groups was statistically significant (P < .05). CONCLUSION: Combined intradiscal and periganglionic injection of medical ozone and periganglionic injection of steroids has a cumulative effect that enhances the overall outcome of treatment for pain caused by disk herniation. Oxygen-ozone therapy is a useful treatment for lumbar disk herniation that has failed to respond to conservative management. Noninvasive procedures, minimally invasive percutaneous injection, and surgery represent the gamut of treatments available in the management of lumbar disk herniation. Noninvasive treatments are plainly the first choice in most cases (1), but when patients fail to respond, minimally invasive percutaneous injection or surgery is warranted. Minimally invasive treatments were developed to offer good clinical results combined with a well-tolerated, low-cost procedure. In recent years, these procedures were further boosted by a growing number of reports of 5–20% treatment failure rate after surgical diskectomy, with failed back surgery syndrome in 15% of cases (2–9). Oxygen-ozone therapy is one of the different minimally invasive treatments currently available (10–13). It is used in medicine to treat different conditions (14, 15) and is based on exploiting the chemical properties of ozone, an unstable allotropic form of oxygen with the symbol O3 and a molecular weight of 48 kDa. A vast bibliography on the topic can be found in a recent study on how oxygen-ozone therapy works (16). A reduction in herniated disk volume is one of the therapeutic aims of intradiscal administration of medical ozone, as disk shrinkage may reduce nerve root compression (17). Another reason for using medical ozone to treat disk herniation is its analgesic and antiinflammatory effects (15, 18). In the wake of reports on the efficacy of periganglionic administration of steroids to treat pain from disk herniation (19–22), we combined an intradiscal injection of medical ozone with subsequent periganglionic injection of a mixture containing a corticosteroid and an anesthetic in one group of patients. We assessed the results obtained in treating 600 patients with oxygen-ozone therapy and compared the outcome in patients receiving medical ozone alone with that in patients who also received a corticosteroid and anesthetic mixture injected at the same session. From January 1999 to March 2001, 600 patients aged 20–80 years were treated with a single session of oxygen-ozone therapy. The patients observed in this multicenter study had not been randomized, nor was the treatment compared with an accepted reference standard since ethical constraints precluded a randomized blind study design (23). These patients represent a consecutive sequence of patients who presented with lumbar disk herniation during the 2 years and who were judged not to be surgical candidates for clinical or anatomic reasons. Informed consent was obtained from all patients. Three hundred patients (group A, Bellaria Hospital, Bologna, Italy) received an intradiscal (4 mL) and periganglionic (8 mL) injection of an oxygen-ozone mixture with an ozone concentration of 27 μg/mL. The other 300 patients (group B, Anthea Hospital, Bari, Italy) received identical oxygen-ozone injections, followed by a periganglionic injection of corticosteroid (1 mL of Depo-Medrone 40 mg [Pharmacia & Upjohn, Milan, Italy]) and anesthetic (2 mL of Marcain 0.5% [Biologici Italia Laboratories, Novate Milanese, MI, Italy]) at the same session. The oxygen-ozone gas mixture was obtained by using a Multiossigen PM95 generator (Multiossigen s.r.l., Gorle, BG, Italy). 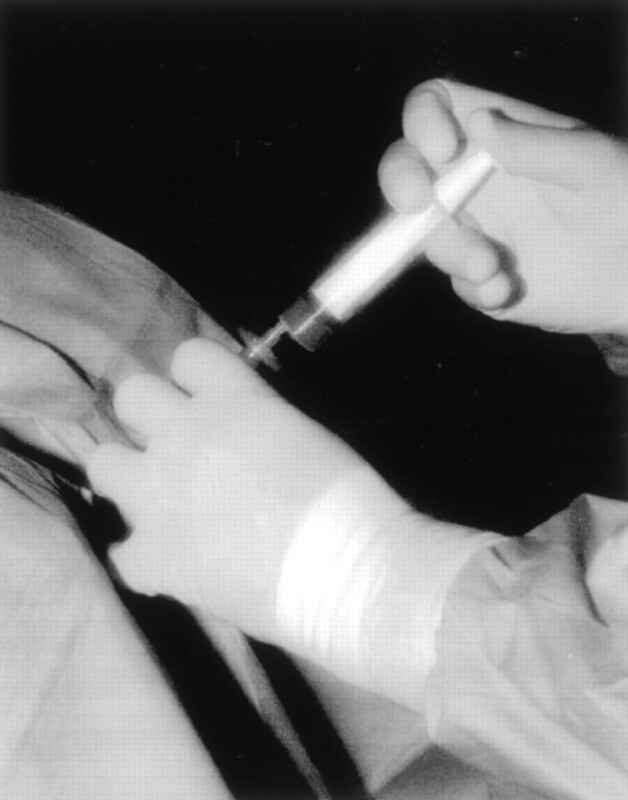 Intradiscal and periganglionic injection was administered by means of an extraspinal lateral approach, using a 22-gauge 17.78-cm Becton Dickinson spinal needle (Quincke Type Point; Becton Dickinson & Co., Franklin Lakes, NJ), as used for discography under fluoroscopic guidance (group A) (12, 24, 25) or CT guidance (group B) (26) (Fig 1), from the same side as the main location of symptoms. The gas mixture was injected by using a polypropylene syringe with the interconnection of a millipore filter (Fig 2). Time for injection was globally 15 seconds. A longer time is not suitable because of the unstable condition of medical ozone, which starts decaying (2 μg/mL) after about 20 seconds. No premedication or anesthesia was given to either group, and the procedure was performed at an outpatient facility. The L4–5 level was the most frequently treated (61.8%); L1–2, 0.7%; L2–3, 1.2%; L3–4, 8.7%; L5-S1, 27.6%. Puncture at L4-L5 performed under CT guidance. Injection of the oxygen-ozone mixture through a millipore filter. Selection criteria for oxygen-ozone therapy were the following. Clinical criterion was low back pain resistant to conservative management (drugs, physiotherapy, and others), lasting at least 3 months. Neurologic criterion was low back pain with positive signs of nerve root involvement, with or without paraesthesia or hypaesthesia, with appropriate dermatome distribution. Neuroradiologic criteria were CT and/or MR evidence of contained disk herniation, in line with the patient’s clinical symptoms, with or without disk degeneration, and residues of surgical microdiskectomy with recurrent herniation. Exclusion criteria for oxygen-ozone therapy were neuroradiologic evidence of disk prolapse or free fragments of herniated disk, and major neurologic deficit correlated to disk disease. In these cases, the patients underwent surgical treatment. At the end of treatment, patients were advised to rest in supine decubitus position for 2 hours. All patients were discharged on the same day as treatment. On discharge, patients were instructed to gradually resume motor activity. All patients underwent follow-up examinations 2 weeks, 2 months, and 6 months after treatment. Clinical outcome was assessed 6 months after treatment by applying the modified MacNab method (Table ) (8, 27). Results were evaluated by two observers (R.R., F.d.S.) who were blinded to patient distribution within the two groups, by using a questionnaire and direct patient interviews. Statistical analysis was performed by means of the χ2 test. Treatment was a success in 211 patients (70.3%) in group A and 235 patients (78.3%) in group B. In the remaining 89 patients (29.7%) in group A and 65 patients (21.7%) in group B, treatment was deemed a failure. The difference in outcome in the two groups was statistically significant at χ2 test (P < .05). Among the group A patients whose treatment was a success, outcome was excellent in 151 patients (50.3%) and good in 60 (20%). 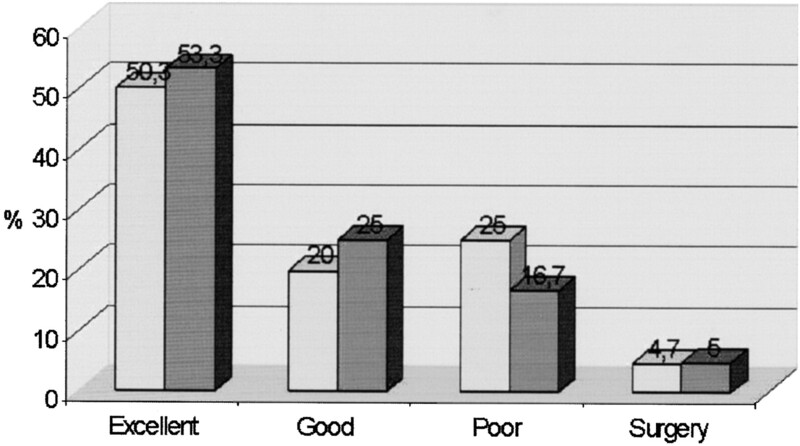 Among the patients in group A whose treatment was a failure, this was poor in 75 (25%) and poor with recourse to surgery in 14 (4.7%) (Fig 3). Among the patients in group B whose treatment was a success, outcome was excellent in 160 cases (53.3%) and good in 75 (25%). Among the patients in group B whose treatment was a failure, this was poor in 50 (16.7%) and poor with recourse to surgery in 15 (5%) (Fig 3). Therapeutic outcome 6 months after oxygen-ozone therapy. Light gray bars indicate group A (n=300); dark gray bars, group B (n=300). Numbers at top of bars are percentages. Complications occurred in two group B patients, who presented with episodes of impaired sensitivity in the lower limb ipsilateral to the treatment; the episode resolved spontaneously within 2 hours. The appropriate treatment of lumbar sciatica and disk herniation is a challenge, particularly because the concept of a disk hernia represents only a simplification of the problem. So many largely unknown or poorly understood factors are involved in the pathophysiology of this disease that the right treatment is very difficult to pinpoint; this is the main reason so many treatments are continuously proposed. In addition, many specialists are convinced that conservative treatment offers the same level of results, if checked at a late follow-up, with surgery being undertaken less frequently. In this setting, attention has focused on minimally invasive treatments. Our study addressed the use of an oxygen-ozone mixture, the least invasive technique currently available. Oxygen-ozone therapy exploits the chemical properties of ozone, an unstable allotropic form of oxygen with the symbol O3 and a molecular weight of 48 kDa. Many biologic effects have been attributed to ozone: increased glycolysis (28); effects on red blood cells (29, 30); effects on rheology (31); bactericidal, fungicide, and virustatic (28); immunomodulating action (29, 32); and analgesic and antiinflammatory effects (15, 18). This broad spectrum of action explains the many indications for medical ozone administration (14). The dose of ozone administered is crucial (33) and must not exceed the capacity of antioxidant enzymes (superoxide dismutase and catalase)and glutathione to prevent accumulation of the superoxide anion (O2-) and hydrogen peroxide (H2O2) (34–36), which can cause cell membrane degradation (33, 37). Free radicals are mainly formed by ozone in a medium with a pH higher than 8, whereas at a pH less than 7.5 the ozonolysis mechanism prevails, mainly leading to the formation of peroxides (35, 38). In oxygen-ozone therapy, ozone is administered in the form of an oxygen-ozone gas mixture, medical ozone, at nontoxic concentrations varying from 1 to 40 μg of ozone per milliliter of oxygen (14). Empirical studies performed in vivo on rabbits and in vitro on resected human disk specimens have demonstrated that for intradiscal administration the optimal concentration of ozone per milliliter of oxygen is 27 μg. At this concentration, ozone has a direct effect on the proteoglycans composing the disk’s nucleus pulposus, resulting in its release of water molecules and subsequent cell degeneration of the matrix, which is replaced by fibrous tissues in the space of 5 weeks and the formation of new blood cells. Together, these events result in a reduction in disk volume (15). In our series, these effects were confirmed in five histologic disk specimens removed during surgical microdiskectomy from patients who had received intradiscal injections of medical ozone at a concentration of 27 μg/mL. 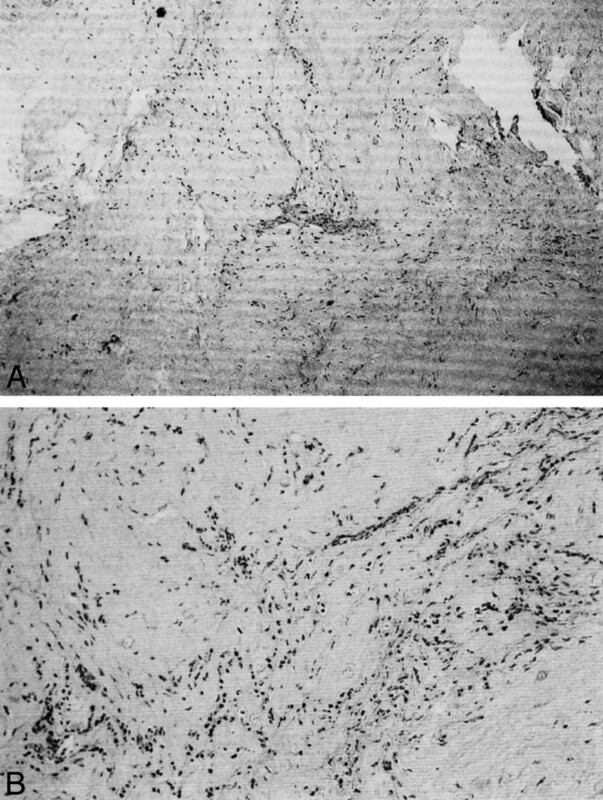 The specific feature of oxygen-ozone therapy noted in these specimens was dehydration of the fibrillary matrix of the nucleus pulposus, revealing collagen fibers and signs of regression (vacuole formation and fragmentation)—a sort of disk “mummification.” The other findings such as chondrocyte hyperplasia at the lesion margin, proliferating and large, and signs of new blood cell formation accompanied by mainly lymphocyte inflammatory tissue are commonly encountered at histopathologic examination of a herniated disk not treated with medical ozone (39) (Fig 4). A reduction in herniated disk volume is one of the therapeutic motives for intradiscal administration of medical ozone, as a reduction in disk size may reduce nerve root compression (17). Disk shrinkage may also help to reduce venous stasis caused by disk compression of vessels, thereby improving local microcirculation and increasing the supply of oxygen. This effect has a positive effect on pain as the nerve roots are sensitive to hypoxia. Another reason for using medical ozone to treat disk herniation is its analgesic and antiinflammatory effects (15, 18), which may counteract disk-induced pain (40, 41). This action is correlated to inhibited synthesis of proinflammatory prostaglandins or release of bradykinin or release of algogenic compounds; increased release of antagonists or soluble receptors able to neutralize proinflammatory cytokines like interleukin (IL)-1, IL-2, IL-8, IL-12, IL-15, interferon-α, and tumor necrosis factor-α; and increased release of immunosuppressor cytokines like transforming growth factor-β1 and IL-10 (15, 18). A, Low-magnification photomicrograph of histologic specimen of the intervertebral disk shows chronic inflammatory infiltrate (hematoxylin & eosin stain; original magnification, × 4). B, Higher magnification photomicrograph of histologic disk specimen discloses the lymphocytic nature of the infiltrate (hematoxylin & eosin stain; original magnification, × 10). In the wake of literature reports on the efficacy of periganglionic administration of steroids to treat disk-induced pain (19–22), this study combined intradiscal injection of medical ozone with subsequent periganglionic injection of a corticosteroid and anesthetic mixture (group B) and compared the outcome to findings in patients receiving intradiscal ozone injection alone (group A). The mechanisms underlying the periganglionic administration of steroids are correlated to both the substance administered and the strategic role of the spinal ganglion in causing and transmitting pain (14, 42–44). Therapeutic outcome evaluated 6 months after treatment was a success in 70.3% of group A patients and 78.3% of group B patients, whereas the failure rate was 29.7% in group A and 21.7% in group B. Group B therefore presented a cumulative effect of corticosteroid and ozone effects that enhanced the therapeutic success rate. The combined intradiscal and periganglionic injection of medical ozone and periganglionic injection of a corticosteroid is thought to affect both the mechanical and inflammatory components of pain caused by disk herniation, enhancing the effect of periganglionic injection of steroids alone (19–22). In our group B patients, anesthetic administration may have led to early improvement in pain, as most patients with an excellent or good outcome had a clinical course as follows: 1) immediate total or partial remission of pain, 2) stability or mild worsening of pain in the subsequent 2 weeks, and 3) a second improvement phase in the space of 6–8 weeks. The initial phase of immediate pain relief was much less evident in group A patients in whom symptoms improved gradually. Comparison of our results with those of other percutaneous treatments for disk herniation indicates that the outcome in our series was satisfactory. In particular, our success rates are similar to those of enzymatic chemonucleolysis (5–7, 45, 46). This is important as these two procedures are similar, although oxygen-ozone therapy is less invasive for the following reasons: the needle used is narrower and hence less traumatic; there are no allergic or anaphylactic reactions (0.5% and 0.05%, respectively) and hence premedication is not required; discomfort after treatment and recommended bed rest are 2–3 days compared with the 1–2 weeks advised after enzymatic chemonucleolysis; and treatment can be repeated. Also, ozone has a well known antiseptic activity, reducing the risk of infectious complications (25). The patients in our series who failed to benefit from oxygen-ozone therapy subsequently underwent surgery. In all cases, the previous oxygen-ozone treatment had no negative effect on the surgical procedure. The complications we encountered in two of our group B patients are thought to have been caused by the periganglionic injection of anesthetic. Our study provides evidence that the combined intradiscal and periganglionic injection of medical ozone and periganglionic injection of steroids has a cumulative effect that enhances the overall outcome of treatment. For this reason, oxygen-ozone therapy is an option to treat lumbar disk herniation that has failed to respond to conservative management, before recourse to surgery or when surgery is not possible. Accepted after revision October 23, 2002. Therapeutic Periradicular Injections: It's a Gas!